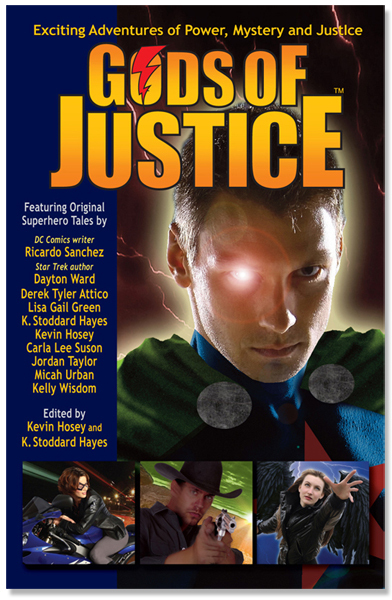 Ray Tate over at ComicsBulletin just posted his review of Gods of Justice, the super hero anthology from Cliffhanger Books that I contributed to. Definitely the best overall review of the book to date. Ray goes story by story and checks off what makes each entry in the book good or bad. Finally, Ricardo Sanchez contributes my favorite tale in the book, “The Death and Life of a Hero.” I’m a sucker for such an uplifting story in which the hero receives his due from the people he has saved. I loved that same theme in Buffy, the Vampire Slayer as well as in Early Edition, and I love it here, too. Sanchez also should be commended for creating a unique Superman-like figure that never once actually imitates the Man of Steel. The archetypal Hero really does seem like a different man here. I am embarrassingly flattered. I definitely had Superman in mind when I was writing my story, specifically the Christopher Reeves version. There is just something about the way he portrayed the Man of Steel that has always resonated with me. Made me feel hopeful. I wanted to re-create that feeling. Seems like, for Ray at least, I did. As a writer, it just doesn’t get better than that. So go check out the full review then go buy the book. If you believe Ray, you won’t be sorry!